Orphan Drug Tax Credits In Lawmakers' Sights : Shots - Health News The Republican tax plan could reduce or eliminate federal tax credits that reward companies for developing drugs to treat rare diseases. People who benefit from the medicines have objected. Peter Saltonstall, president of the National Organization of Rare Disorders, speaks at a rally Tuesday in support of tax credits for companies that develop drugs for rare diseases. As President Trump talked tax overhaul on Capitol Hill Tuesday, Arkansas patient advocate Andrea Taylor was also meeting with lawmakers and asking them to save a corporate tax credit for companies that develop drugs for rare diseases. Taking the credit away, Taylor said, "eliminates the possibility for my child to have a bright and happy future." Taylor, whose 9-year-old son, Aiden, has a rare connective tissue disorder, spoke as part of a small rally organized this week by the National Organization for Rare Disorders — the nation's largest advocacy group for patients with rare diseases. The Senate Finance Committee, led by Sen. Orrin Hatch, R-Utah, put the tax credit back into the tax legislation. After some negotiations, the committee settled on reducing the credit to 27.5 percent of the costs of preapproved clinical research, compared with the current 50 percent. The committee also restored a provision that would have eliminated any credits for drugmakers who repurpose a mass-market drug as an orphan. Today, many orphan medicines treat more than one condition and often come with astronomical prices. Many of the medicines aren't entirely new, either. A Kaiser Health News investigation, which was also aired and published by NPR, found that more than 70 of the roughly 450 individual drugs given orphan status were first approved for mass-market use, including cholesterol blockbuster Crestor, Abilify for psychiatric conditions, cancer drug Herceptin and rheumatoid arthritis drug Humira, which for years was the best-selling medicine in the world. More than 80 other orphans won Food and Drug Administration approval for more than one rare disease and, in some cases, multiple rare diseases, the KHN investigation showed. "As with any major reform, tough choices have to be made," a Hatch spokesperson wrote in an emailed statement, adding that the senator will continue to work "to make the appropriate policy decisions" to deliver a comprehensive tax overhaul. Hatch, who is a member of a rare-disease congressional caucus, received $102,600 in campaign contributions from pharmaceutical and related trade group political action committees in the first half of 2017, making him the top recipient of pharmaceutical cash in the Senate. Orphan drug development has become big business in recent years and advocates as well as critics of the industry say tax credits have been an important motivation for companies. Orphan drugs accounted for 7.9 percent of total U.S. drug sales in 2016, according to a report released by QuintilesIMS and NORD. Because patient populations for rare-disease drugs are relatively small, companies often charge premium pricing for the medicines. EvaluatePharma, a company that analyzes the drug industry, estimates that among the top 100 drugs in the U.S. the average annual cost per patient for an orphan drug was $140,443 in 2016. Giant pharmaceutical companies such as Celgene, Roche, Novartis, AbbVie and Johnson & Johnson have led worldwide sales in the orphan market, according to EvaluatePharma's 2017 Orphan Drug Report. 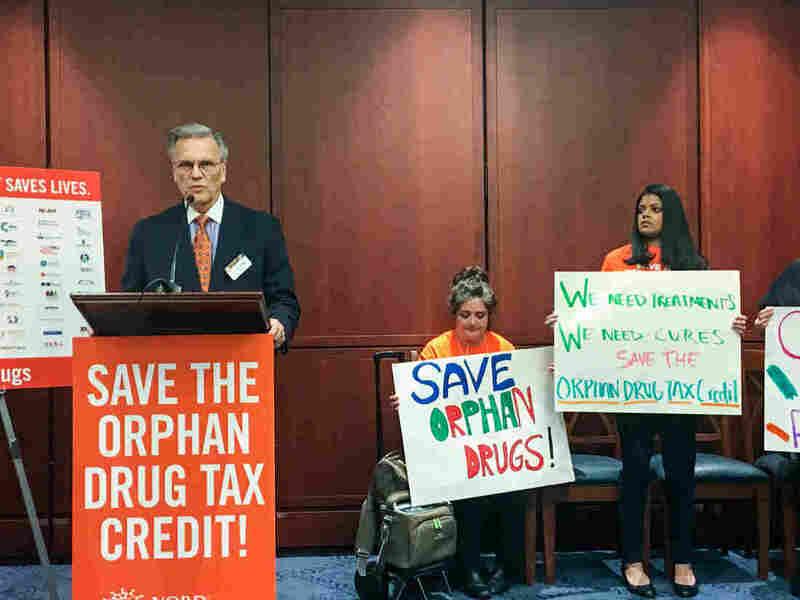 Jonathan Gardner, U.S. news editor for EvaluatePharma, said the orphan drug tax credit is "probably the most important incentive for developing an orphan drug." Cutting the credit will force even the large companies to question development of drugs for rare diseasess, Gardner said. Dr. Aaron Kesselheim, an associate professor of medicine at Harvard Medical School, has been critical of the Orphan Drug Act's incentives and of companies taking advantage of the law's financial incentives for profit. But he warned against rushing to eliminate the tax credit. "We need to think about ways we can improve the Orphan Drug Act and stop people from gaming the system and exploiting it," Kesselheim said. But there "are a lot of rare diseases that don't have treatments. So, we need to be careful in making changes." 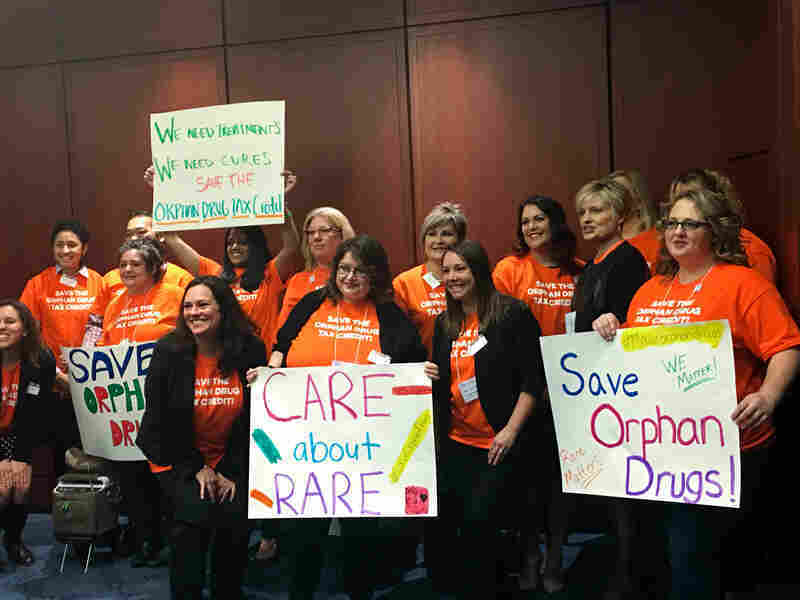 Advocates for the National Organization of Rare Disorders rallied on Capitol Hill and then visited a couple of dozen lawmakers to argue for the orphan drug tax credit. The battle over the tax credit is the latest controversy for the FDA's orphan drug program. FDA Commissioner Scott Gottlieb announced a "modernization" plan for the agency this summer, closing a pediatric testing loophole and eliminating a backlog of corporate applications for orphan drug status. And, this week, the agency confirmed that Dr. Gayatri Rao, director for the Office of Orphan Products Development, is leaving. Meanwhile, the Government Accountability Office confirmed this month that it recently launched an investigation of the orphan drug program. The GAO's review was sparked by a letter from top Republican Sens. Hatch, Chuck Grassley, R-Iowa, and Tom Cotton, R-Ark., asking the agency to investigate whether drugmakers "might be taking advantage" of the drug approval process. The pharmaceutical industry has had a muted response to the tax bill, which includes a corporate tax cut. The powerful industry lobbying group PhRMA said it is pleased Congress is looking at overhauling the tax code but "encourages policymakers to maintain incentives" for rare diseases. BIO, the Biotechnology Innovation Organization that represents biomedical companies, said it was "gratified" the Senate committee chose to partially retain the credit but would prefer to keep the existing incentive. The group that rallied Tuesday — wearing bright-orange shirts that read "Save the Orphan Drug Tax Credit" — planned to meet with a couple of dozen lawmakers, including Grassley, who is a member of the Senate Finance Committee. NORD, like many patient advocacy groups, receives funding from pharmaceutical companies but the organization's leaders say the industry does not have members on the board and does not dictate how general donations are spent. On Tuesday, NORD leaders said they are open to discussions about the tax credit, and whether the overall law is working as intended. "We're here to have that conversation; we're ready to have that conversation," said Paul Melmeyer, director of federal policy for NORD. "Sadly, that's not the conversation we are having today." Abbey Meyers, a founder of NORD and the leading advocate behind passing the initial 1983 law, said she fears the high cost of the drugs will make it impossible to sustain the orphan drug program. Now retired, Meyers said she has followed the law's success over the years and believes the tax credit should not be changed. "There are other things that have happened since the law was passed where there wasn't any logic to what they did," Meyers said, adding "because somebody went to a senator and they put into the law." KHN's coverage of prescription drug development, costs and pricing is supported by the Laura and John Arnold Foundation. Dr. Aaron Kesselheim's work is also supported by the foundation.